Same. Always use conti belts on my bimmers. Another problem with belts is that, people wait until the belt breaks or in an emergency, then run to local auto parts stores, which carry mostly American-made belts such as Gates. Gates is good, but sometimes it could be off a bit. If people plan way ahead and order appropriate belts made by let's say Mitsuboshi or Conti, they will be happy. Something I try to do to avoid that predicament is to replace the belts as part of preventive maintenance (i.e., before the belt fails), and then save the old one and carry it in the car next to the spare tire. I know it's not so helpful while stuck in a problem, to hear how I could have easily avoided it, but anyway, hopefully this helps someone else. BTW, back onto the problem in this thread, I still think that mis-routing is a more likely scenario than rockauto selling the wrong part. I know both are possible, but it is so easy to mis-route. And a 1/2" error in length will mean about 1/4" travel of the tensioner, which should still allow it to fit, even though it is not right. Most belts have either the inches (64 in this case) or the mm in the part number, along with the number of ribs (7 in this case). So you can do your own easy error-check when ordering, and not assume rockauto's catalog is right. If you can multiply by 25.4, you can even translate between the inch vs. metric belts (64" = 1625.6 mm). And then hold the two belts next to eachother to confirm length before installing, unless your original belt melted as happened here. There is a slight difference since some belts are spec'ed by outer diameter and some are spec'ed by effective length, which will be different by a couple of mm. I'd expect up to about 3mm difference would be no problem at all. 1/2 inch (12.7 mm) should probably fit with difficulty, but should probably not be used. I went ahead and ordered the conti belt with the 1623 mm or 63.90 inches instead of the conti at 1625.6 mm or 64 inches. There is so much room with the Gates belt on there now that I am forced to use the Conti at the smallest measurements. I will let you now how it works out when I get the belts by Friday and install it immediately. Why is is always on the vehicle that is a pain in the a** to undo? It is quite possible to invent a path that goes on and doesn't tighten correctly so +1 on verify the correct path. I think this is the correct shape unfortunately it's not actually on the pulleys in the diagram. The other thought: did you have to remove the tensioner to get out the alternator? Did you put it on correctly? 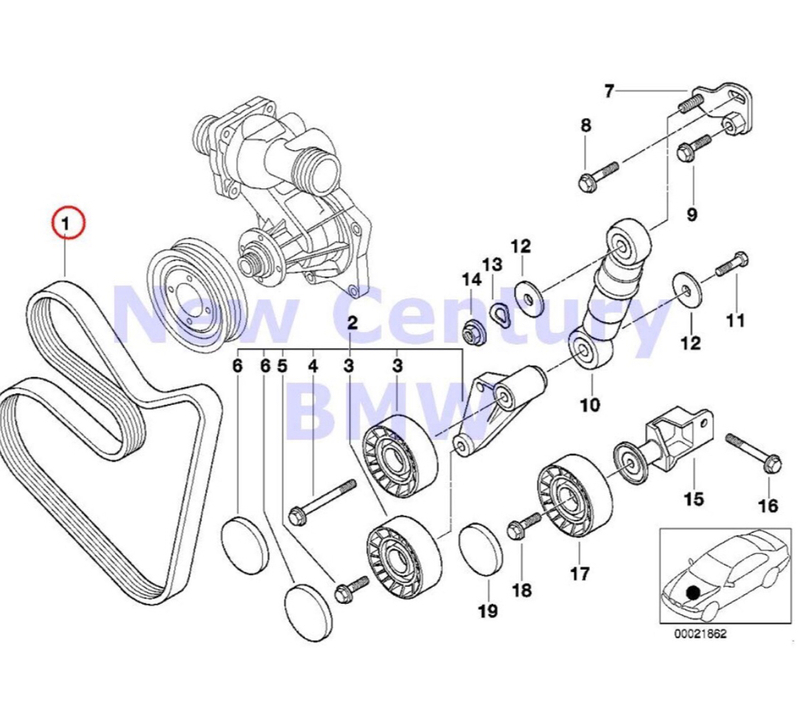 I recall putting tensioner on a 4.4 motor and that it was possible to put it on a couple ways that both seemed to work I think I found a photo online to confirm which was correct. Last edited by andrewwynn; 04-03-2019 at 11:09 AM.